1 tube of choice – I used the adorable artwork of Robin Pushay which can be purchased from Artistic Dreams Imaging. 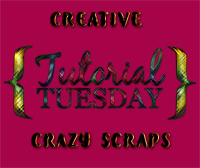 “Seashells & Sandcastles Add On” is a FTU tagger size scrap kit created by me, Bev of HorsePlay’s Pasture Designs and can be downloaded from my blog here. This tutorial was written assuming you have a working knowledge of PSP. Open up a 700 x 700 blank canvas. Copy and paste El1 as a new layer. Don’t worry about placement just yet. Move the frames and your tube (resize as needed) into exact position – see my tag for reference. Click inside of it with your Magic Wand. New Raster layer below the frame. Copy and paste Paper 5 Into Selection. Copy and paste El4 as a new layer. Move into position – see my tag for reference. Duplicate the element and resize 75%. 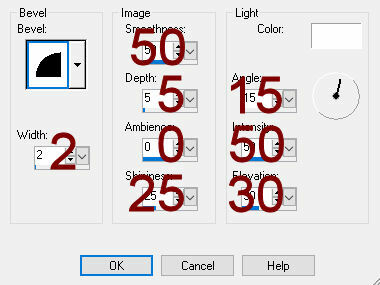 Lower the Opacity of one of them to 20. Resize the other 75% and position within the top frame – see my tag for reference. Position within the top frame – see my tag for reference. Copy and paste Paper 4 Into Selection. New Raster layer above the mask layer. Copy and paste Paper 6 Into Selection. Change the Opacity of this layer to Burn. Make your Ellipse Tool active. Create a circle the size of the mask – see where the words are on my tag for reference. In your color pallet, open up the background color. Make your Text Tool active. Move the cursor along the top of the circle until you see a Rocking A and click the mouse. The text box will open. Type the words “Seashells & Sandcastles”, hit the space bar 4x’s, type “GOOD MORNING” in all capital letters, hit the space bar 4x’s. Use your mouse and highlight all the words and spaces, Right click the mouse and choose Copy. Left click your mouse in the text box – the cursor should appear after the last 4 spaces. Press Ctl + V on your keyboard. The entire phrase you copied should paste. Keep an eye on your tag and continue pressing Ctrl + V until all the words come to full circle. If you find you have extra spaces and can’t fit another phrase then just click your mouse in the spaces after each phrase and add another space until it looks spaced out nicely. In your layers pallet click on the eye of the New Ellipse layer. Right click your mouse on Vector 1 layer. Choose Convert to Raster layer. Make your Freehand Selection Tool active, set on Point to Point. Encircle each of the GOOD MORNING words in your circle. Make your Color Replacer Tool active and double right click on one of the GOOD MORNING phrases. All of the GOOD MORNING phrases should turn blue. In your color pallet change the background color to #188253. Double right click your Color Replacer tool on the words “Seashells & Sandcastles”. All of those phrases should turn green. Duplicate the ring of words. Give it a drop shadow. Set the size to 167 and Hardness to 50. Barely brush the tool along the bottom of your name to give it a hint of blue color. Give your name a drop shadow. Close out your white background. Save your tag as a PNG. I’d love to see your results. They're simple and easy - My templates are for personal use only. You may use them in challenges but please direct to my blog for download. DO NOT share throughout groups, take apart or take claim. HAVE FUN!! My name is Bev. I enjoy creating signature tags and writing tutorials for designers, making kits, templates, masks, and the occasional layout. I also enjoy writing and have published my first novel "Written in the Stars".